Or just the voltage just switch on / off? The burner head stepper motor shaft is secured? The voltage is just switched on/off. The tungsten electrode is held in a free moving pivot (with bottom end stop) and when necessary, it is raised clear of the work by the Z axis. You may not drawing anything away from the source? Find out how they work or how they are connected to the CNC. What was the need for operation and amps? I also like to try! And what materials can be used? I think aluminum is not good. 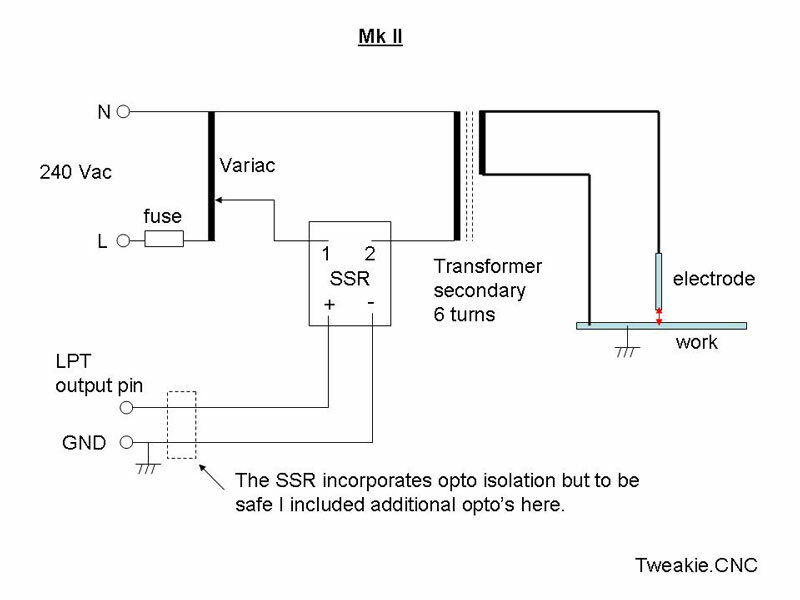 I don’t know if this is any help but here is the circuit of the MkI which I have used so far. 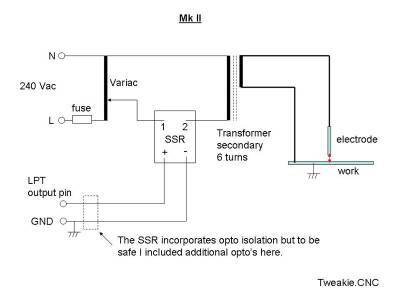 I have now rewound the transformer and will try the MkII circuit using a Variac (larger version of the Meccano controller) to set the output voltage. This may not be the best circuit solution, only experimentation will tell so it would be nice if others try different circuits and setups etc. Basically a tiny arc is struck between the tip of the electrode and the work and it is the extreme heat created by this arc which slightly etches and discolours the surface of the work-piece. 1) As Amator has already mentioned, an arc creates electrical noise so it is important that the work is correctly earthed and any signal wiring (such as limit switches etc. and other input wires) are properly shielded otherwise the electrical noise may affect the correct operation of the CNC machine. 2) Electrical resistance in the low voltage, high current wiring connections is to be avoided as even a fraction of 1 ohm can generate significant heat so take care. 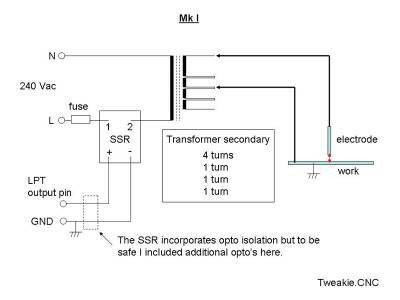 3) My transformer secondary windings were initially made with 2mm dia. copper wire and this was found to be inadequate (getting very hot). 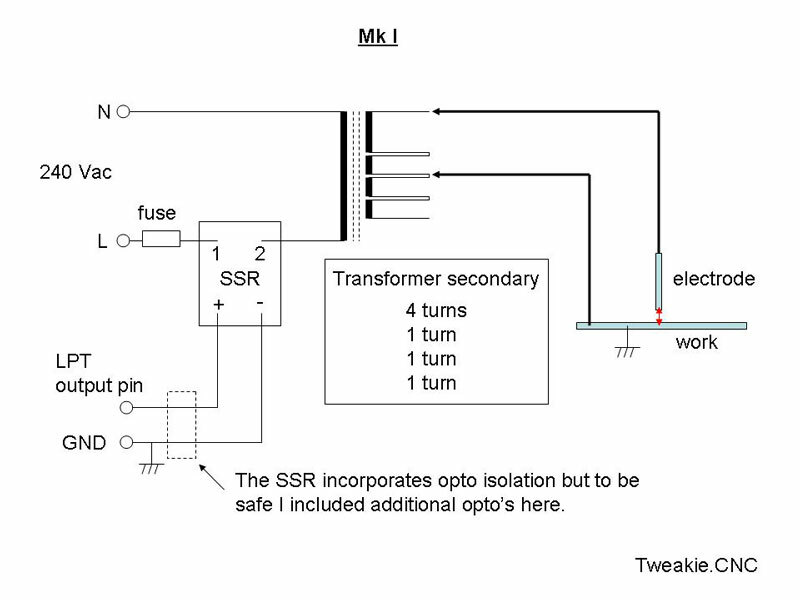 The new transformer (MkII circuit) uses rectangular 5mm x 2.5mm copper wire for the secondary winding, this is an improvement and only just gets warm. 4) I have not managed to find (in my boxes of junk) a suitable shunt to be able to measure the output current directly but assuming my transformer is 50% efficient then measuring the transformer input current and voltage I can deduce the output current to be around 9-10Amps at 1.8Volts (but it could be more than 10Amps – it really needs to be measured properly). 5) Considerable heat is generated in the electrode itself – this heat is being transmitted back to my pivot bearings and insulated mount so I need to incorporate a ceramic or similar high temperature heat insulator to hold the electrode. 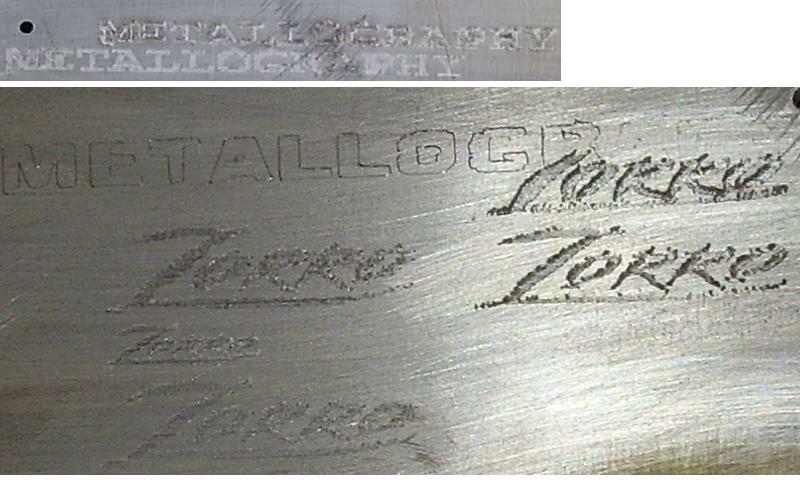 6) The process is only really suitable for use with steel – the higher the carbon content the better but I have not yet tried steel alloys, tool steel etc - these may react differently. I hope this helps others who may like to experiment with this process. Nem építetem külön áramkört,hanem a pirogréfom hőfokszabályozó pwm áramkörével készítettem. Az egyik pólusra egy 2mm-es kanthal huzalt kötöttem,az végezte a rajzolást,a másik pólust,pedik a fémlemezhez rögzítettem. Ez egy 5mm vastag vaslemez volt,felcsiszolva. A teljesítményt többször is feljebb vettem. A világosabbak a kisebb teljesítménnyel készült képek. Vajon Tungsten jobb, mint a Kanthal ?